With an unparalleled private beachfront setting on the east end of Long Bay, The Beach Enclave Long Bay offers an elevated residential experience. 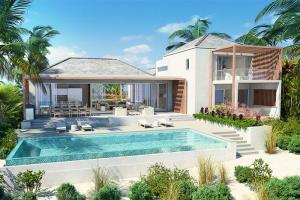 Situated on nearly one-acre each, the five-bedroom villas range from 7,800 to 8,100 square feet and may include: guest cottages, garages or carports, outdoor showers, indoor-outdoor kitchens, furnished beach lounge decks, fire pits and expansive pools. On the cutting-edge of hospitality, this flagship community redefines beachfront living with on-call personal butlers, housekeepers, and chefs for any whim. Your dedicated concierge adds the finishing touch with private boat, bonfire, car rental, and special event arrangements. The three-mile Long Bay beach ranks among the Top 10 in the world.